Rinse and drain the cannelini beans in a colander. Heat oil in a pan, add the onions and garlic and cooked until just starting to turn brown. Add the tomatoes and cook briefly. Add the chillies and lemon zest, followed by the cannelini beans. Stir gently to coat in the oil. Season with salt and pepper and mix in the chopped parsley. Slice the Vegetarain Black Pudding; this is easy to do if you slice it after taking it out of the fridge. Heat some extra virgin rapeseed oil in a clean pan. Test to see if the oil is hot and add the slices of Vegetarian Black Pudding. Fry until crispy before carefully turning over. 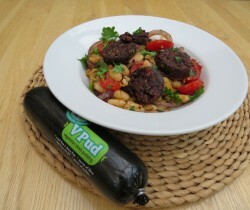 When the V Pud is cooked on both sides, remove from the pan and combine with the bean mixture.